This is a circular route which is about 5 miles long. 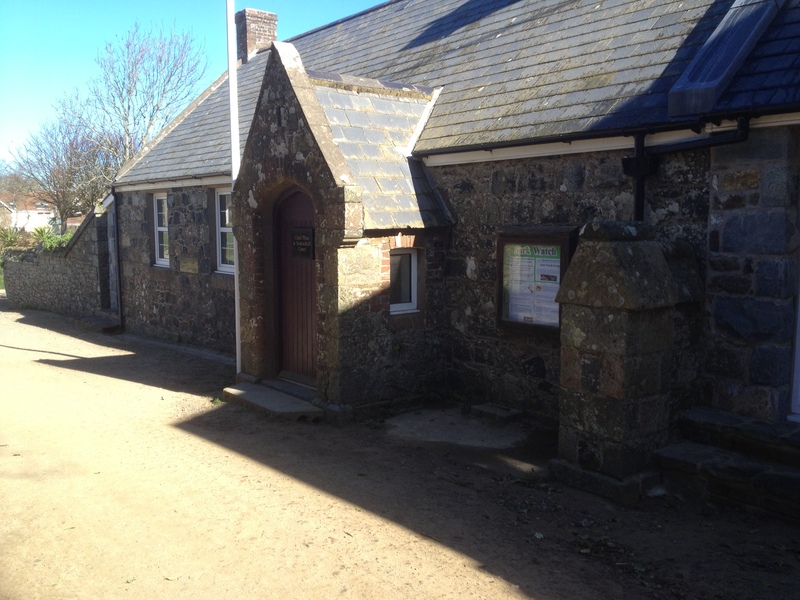 It starts at the Sark Visitor Centre and finishes in the village. It will guide you to many of the most popular spots on the island and provide access to lovely footpaths and stunning scenery. You will also visit several points of historical interest. As much of this walk is on private land, please follow the country code; walk at the edges of fields and always shut gates behind you. The whole walk should take approximately 2 ½ hours, though more if you stop en-route. The route is mainly easy or moderate with no steep ascents or descents. Please note that footpaths do not constitute a right of way and may or may not be open throughout the season. Please keep to the lanes and footpaths and use only designated stiles/steps. Do not walk too close to the cliff edges or any over-hanging ledges. The Isle of Sark administration and the private landowners cannot be held responsible for any accidents, no matter how they might be caused. This building has served many purposes, though was built originally as a school for girls in the 1840s. With the door facing you, the room on the left would have been used as a classroom and the one on the right as the school house. Old gravestones and bones discovered during the digging of the foundations point to the site perhaps being a medieval cemetery. 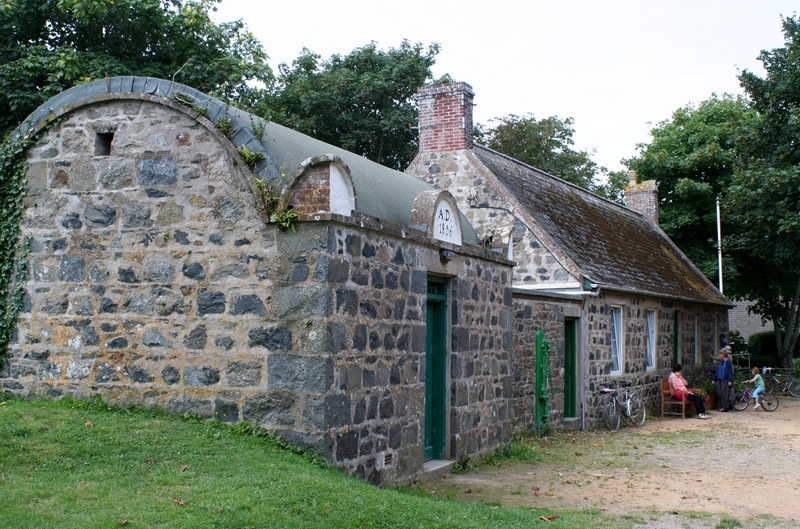 During the Occupation of Sark 1940 – 1945 the building was commandeered by the German army and used a medical facility. With the completion of the new school in 2005 this building became available and is now the Visitor Centre and the headquarters of La Société Sercquaise, Sark’s local history and natural history society. Both are well worth a visit and have exhibitions through the Spring, Summer and Autumn. Opposite you will see the recently renovated Cider Press Barn of historical interest. Next to the Visitor Centre is Sark’s tiny prison. In 1855, a new Seigneur, the liberal Rev. W.T. Collings gave land south of the church for a cemetery. It was consecrated on 3rd August 1855, to replace the short lived prison built to the east of this location in 1832. On 3rd October 1855 Collings persuaded Chief Pleas to pay for a new prison to be built next to the new Girls’ school. Sark may have Collings to thank for the Mediterranean style barrel vaulted roof and the corner wings. The prison has been described as a ‘granite tea caddy’. The date of completion is shown as 1856. Half hidden beneath this façade is the old granite lintel, re-used from the earlier prison, inscribed 1832. The prison has two cells and a toilet. It is not usually open to visitors because it is still very occasionally used, though the crime rate on Sark is extremely low. Coming out of the gate at the Visitor centre take a left turn and follow the road around the corner to arrive at Le Manoir. The original home of the first Seigneur of Sark Helier DeCarteret who, with the permission of Queen Elizabeth I, came from St Ouen in Jersey to settle on Sark in 1565. In return, his obligation was to ensure the island’s future safety from attack by pirates by retaining forty armed men and to pay a 20th of a Knight’s Service Fee, which the present Seigneur still pays to the Crown at Michaelmas. To fulfil this obligation Helier de Carteret divided Sark into forty pieces of land, known as tenements, which have remained much as they are today. He leased thirty-nine of these in perpetuity as feudal holdings to the colonising families, mostly from Jersey and Guernsey, keeping the fortieth in the centre of the island for himself. Le Manoir is built in the style of a typical Jersey farmhouse and although most of the original exterior façade has now been replaced, 4 horizontal diamond shapes signifying the DeCarteret coat of arms can still be seen in the stone work on the left of the main house roof. 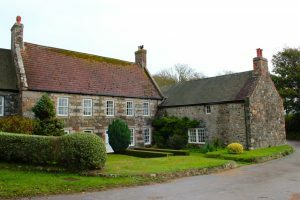 Looking at the main house, which faces south and was fronted in the Regency period, it is clear that the western gable is of a different medieval build. It is immensely thick, at least six feet in width, tapering as all medieval walls do, and with quoins consisting of huge stones, with Helier’s work in red stone at the top. Unfortunately no medieval fire-place remains inside. As well as being the home of the Seigneur, this was also the centre of the islands administration, of worship, and of learning, its long north-south wing accommodating the court, a ‘Calvanist’ temple and the school room. Opposite it was the granary for the island, the ground floor of which doubled as a prison in early times, before the building became the arsenal. Opposite the front of Le Manoir, take the footpath down the meadows to Stocks and Dixcart Bay Hotel, pausing perhaps to admire the new lambs if they are in residence. As the path bears uphill and right just past Stocks Hotel, follow the hairpin bend to the left to walk past Dixcart Bay Hotel, with Hugo’s brasserie style restaurant attached. Continue on the road then cross over the stile on your right signed ‘La Coupée’. Keep to the left of the field, crossing the next stile in the top left corner. 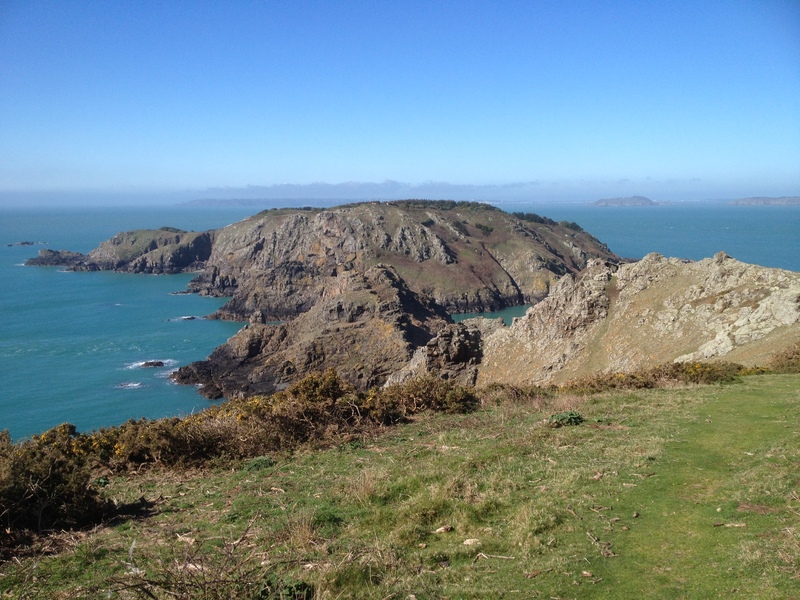 Follow the path which winds and descends, then ascends with wonderful views down to Dixcart Bay (with a bench to rest if needed) and L’Etac and Little Sark in the distance. At the end of the path bear left and go through the barrier, heeding the warning signs about the sheer drop, to get a bird’s eye view of La Coupée. Another bench awaits you just before the headland, a fabulous picnic spot. Lunch and afternoon tea available at Stocks Hotel. La Coupee is a natural isthmus, 100 yards long and 260 feet high, joining Little and Big Sark. The first railings were erected in 1900. A plaque to commemorate the concrete roadway built by German prisoners of war can be seen on the middle of La Coupée on the left hand side. Sark is almost cut in two where the high narrow neck of La Coupée joins diamond shaped big Sark to Little Sark in the South. 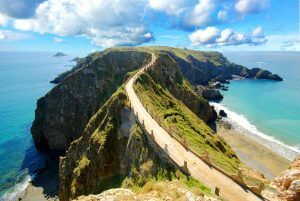 It is a natural isthmus, 100 yards long and 260 feet high and is Sark’s most spectacular feature. Before 1900 when a protective railing was first erected, crossing it must have been terrifying for anyone afraid of heights. 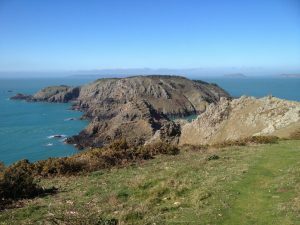 It is said that sometimes the children of Little Sark, going to school on the other side, had to crawl over La Coupee on their hands and knees. Tenant Philippe Hamon was blown to his death in 1731, while carrying a tithe of corn for Dame Le Pelley; and Danny Lanahan, an Irishman working in Little Sark, overbalanced from the railing during an April night. Both went over the sheerer east side. A plaque to commemorate the concrete roadway built by German prisoners of war can be seen on the middle of La Coupée on the left hand side. Cycles must not be used, but can be wheeled across. In December 2009 a large landslip covered the path down to Grand Grêve, the bay on the west side, preventing access to the beach. At La Coupee turn around to follow the road leading away from Little Sark. Very soon you will pass Caraghs’s Chocolate Kitchen and shop on the left. Light snacks are available and Sark Chocolates. Toilets available with purchases. Continue on the road passing L’Espace Gallery, ascending the gentle hill towards the staggered crossroads, taking the turning on the left towards the Beauregard Duckpond. Turn right after Petit Beauregard Guest House & Restaurant and go through the farm gate, then turn immediately left to walk under an avenue of trees with a granite wall on the right and then a barbed wire fence. Go through a metal gate and turn right to follow a grassy track. The large island close to Sark is Brecquou, which is privately owned, though it is part of Sark. Looking in front, you can see the Gouliot headland with spectacular scenery and if you care to take a little more time you can walk straight down to overlook Harve Gosselin on your left and the Gouliot passage straight in front (allow an extra 20 minutes if you follow this path) returning by any path on your left back to the original track, joining it by the two benches. This is another lovely spot for a picnic. Sark’s four hectare RAMSAR site was designated on 9th April 2007 as a site of special importance, in particular with regard to animal and plant life, including the marine life in the in the Gouliot caves, a large sea cave system underneath the headland and home to a colourful and diverse array of sea anemones, sponges and sea squirts. ACCESS TO THE CAVES INVOLVES A SCRAMBLE AND REQUIRES A GOOD KNOWLEDGE OF THE TIDES. The path down is steep and may be inadvisable for vertigo sufferers or those not sure of foot. 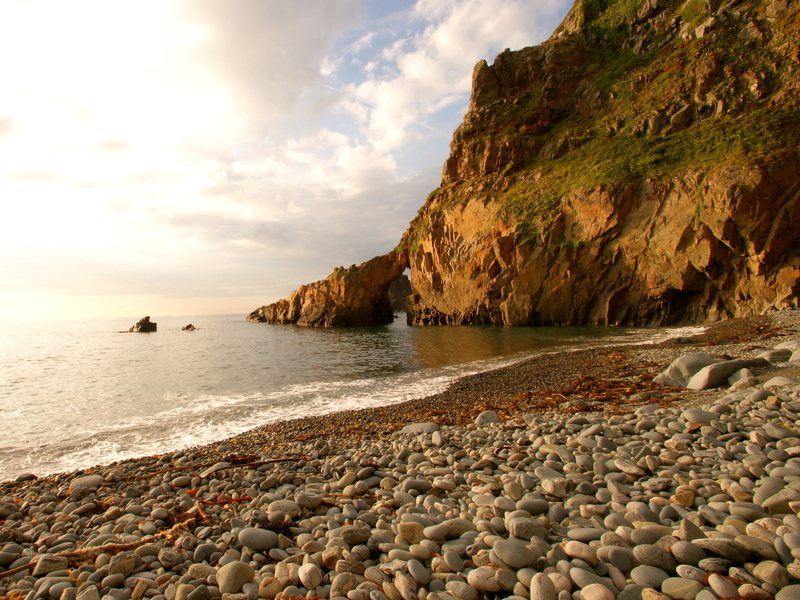 The caves are accessible at the low of a good spring tide. Divers and swimmers can approach at low water from any of the sea entrances, the ‘jewel cave’ being perhaps the most rewarding. The ceiling is high, giving it a cathedral like feeling of magnificence. The Gouliot headland itself is worth exploring. It is extremely rich in rare lichens and has more than 80 species of flowering plants. In May the south side is pink with thrift, while the damper north face is blue with bluebells. Fulmars and peregrines nest here. When the track comes out between two benches, turn almost hairpin right and go through another gate. Keeping on the left hand side of the field, carry on through the next gate. Follow the track as it passes between a stone barn and a corrugated barn, turns right then left just following the track and finally reaches a T junction beside a finger post. Turn left here. The track dips, rises and bends right and left. The granite building on the left, Le Port a la Jument is one of the original 40 homes which settlers built when Sark was colonised in the 16th century. Follow the road as it bends to the right. At the next junction is the Methodist Chapel on the opposite side of the road. 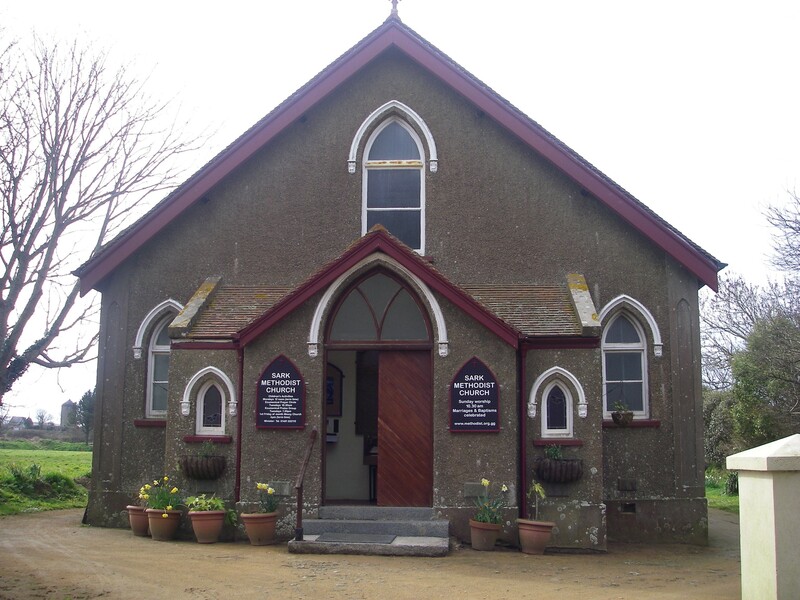 Commissioned in 1926, to replace the earlier Ebenezer Chapel demolished on a site three quarters of a mile away at La Ville Roussel, this Wesleyan Chapel is the oldest chapel in the Guernsey circuit. John Wesley, one of the co-founders of the Methodist Church, wrote to Adam Clarke who was in charge of English work in Guernsey in 1787 expressing his concern for Sark, in particular about the lack of English spoken! Non the less a French preacher called Jean de Quetteville was dispatched to Sark and the history of Methodist preaching on Sark began. The school room behind the chapel was opened by a Jersey Methodist, Mr H Le Feuvre. He unlocked the doors of the school room at the opening of the chapel in April 1926. The chapel was to generate its own power, so an engine room was situated at the back of the school room, on the east side. As late as 2000 there was no kitchen attached to the Chapel or the school room. The engine room was converted in to a kitchen by local residents. During the German occupation of the island, the Germans had taken over the Girls’ school and so they were taught in the Methodist school room. Turn right out of the Chapel, passing Mon Plaisir Stores on the left, then take the lane on the left between the vineyard and the sports field and then the next right, which will bring you out on Rue de La Seigneurie. Turn left. La Seigneurie is approximately 5 minutes further up the road on the left. The wonderful walled landscaped gardens are open to the public from Easter until the end of October. There is an admission fee of £5 per person. La Seigneurie, built in 1675, was originally called La Perronerie, and was one of the original 40 tenement houses. 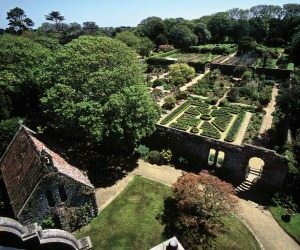 It became La Seigneurie in 1730 when Susanne Le Pelley purchased the Fief of Sark and chose not to move in to Le Manoir, but stay in her own home.The main part of La Seigneurie was either built from new around 1730 when Susanne Le Pelley purchased the Fief of Sark, or more probably was the result of a major re-build of an existing house on the same site, originally known as La Perronerie. She preferred to stay in her family home when she bought the Fief (the right to become feudal lord) so La Perronerie became La Seigneurie, the home of the Seigneur. In 1852 Dame Mary Collings bought Sark from the Le Pelleys (to whom her father had lent money for an ill-fated silver mining venture in Little Sark) and La Seigneurie was again extended and modernised. The greatest changes were made in the 1860s by the Reverend W.T. Collings, the great, great, great grandfather of the current Seigneur Christopher Beaumont. He added the large drawing room wing and the tower as well as building the dovecote. His grand-daughter Sybil Hathaway, the Dame of Sark, disliked the tower and would have pulled it down had the cost not been so high. She did though remove many of the tower’s elaborate pinnacles. La Seigneurie as we see it today was therefore never planned as a whole, but rather evolved in stages to meet the requirements and whims of successive Seigneurs. It has recently undergone extensive internal restoration. Hathaways restaurant at the Seigneurie gardens serve lunches and snacks. Passing La Seigneurie gate on the left continue for a short while until the next turning on the left signed ‘Window in the Rock and Port du Moulin’. Walk past La Maison Rouge Gallery on the left and the bike park on the right and go straight on at the next junction, on to the narrower footpath. A little further on turn left at the sign and start your descent into the L’Ecluse valley on a zig zag path. Heeding the warning signs, carry on to the ‘Window in the Rock’. A little while before you reach it you will pass a large clearing on the left, which provides a perfect picnic spot, overlooking the north west coast. The Window in the Rock was created in the side of the headland at Port du Moulin, blasted out in the 1850s on the directions of the then slightly eccentric Seigneur of Sark W.F. Collings. Nobody can quite agree why, but the view is spectacular, if you have a good head for heights. This is a somewhat startling man-made feature of the Sark landscape created in the side of the headland at Port du Moulin from which visitors can admire beautiful scenery. The hole was blasted out in the 1850s on the directions of the then slightly eccentric Seigneur of Sark William Frederick Collings. Nobody can quite agree why he did it, but the view is spectacular if you have a good head for heights. Some think it was created for the view it offers, others think was made so that seaweed could be hauled up from the sea below to be used for fertiliser. It’s worth a visit just for the amazing views of another area of natural beauty, Les Autelets – (the alters) the rock stacks which lie just off Sark’s north-west coast. Retrace your steps to return La Rue de la Seigneurie and turn right to head back down the road towards the village. The Island Hall is the large building just before the crossroads on the right hand side. Public toilets available at the Island Hall. Freshly prepared light lunches and snacks available. Opposite the Island Hall is the surgery, where our resident doctor lives and practises. Surgery hours are advertised outside. Walk straight ahead at the crossroads and towards the Assembly Room. Continue on this road and pass the Sark Fire and Ambulance Station. 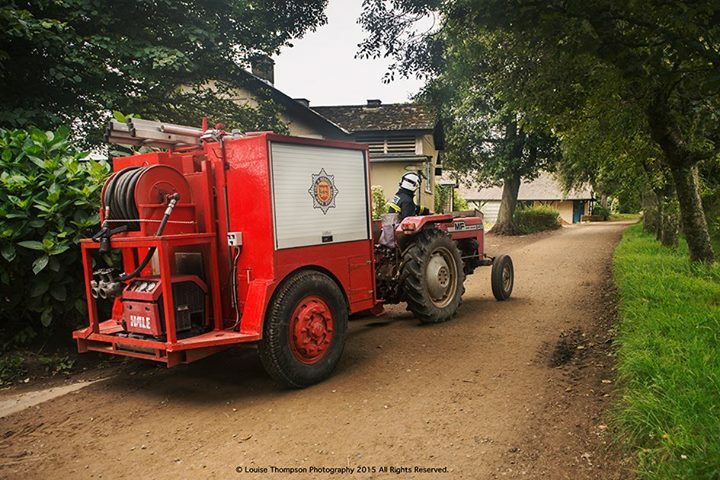 Two serious fires in 1957 prompted the creation of the first Sark Fire Service. Eight men were recruited and trained in fire-fighting techniques and by late 1958 the volunteer Sark Fire Service was born. At present there are 16 personnel on call 24 hours a day, and two relief crew who cover for sickness and holidays. They are all volunteers, each of varying trades and occupations. The fire-crew are not paid a retainer but do receive a small amount of money per hour whilst on duty. Personnel are alerted by “pager” (pocket alerter) and the first one to the Fire Station picks up the telephone to Guernsey Fire Service for details of the incident. 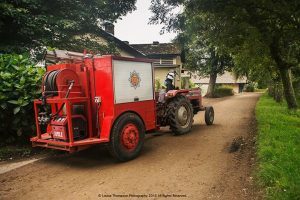 The fire-fighters travel to and from the incident on the tractors in their fire-fighting dress and yellow helmets, one of the rare times that a tractor may carry more than two people at the same time. Along with the training and use of BA sets and medical equipment, the fire service has monthly drills, some of them in the evenings or involving Sark’s other emergency services. 2007 saw the first female fire-fighter join the unit. The basic design of the tractor-drawn appliances has not changed dramatically since 1958, although now the equipment is stowed on board in closed lockers. Equipment is regularly modernised. Due to the fact that there is no fire hydrant system on Sark there is a purpose built hose-layer which can access water from swimming pools and underground tanks located around the island. Further on, on the left hand side you will pass St Peter’s Church. The church dates from 1820. For 250 years following the re-colonisation of Sark in 1565 the islanders worshipped in a long, narrow, barn-like building, thatched and with an earthen floor. Under the Le Pelley Seigneurs (1730-1852) Sark’s ministers continued to be French or Swiss Calvinists. They were appointed by the Seigneur as his chaplains and mostly at his expense. By the time of the Napoleonic Wars, popular hostility to ‘feudal’ institutions had undermined the authority of Seigneur and Minister. Church attendance had lapsed and the tavern stayed open most of the sabbath. Working people in Sark looked to the Methodists for moral leadership and in 1796 a Methodist Chapel costing £300 was built at La Ville Roussel. The project of a Sark Parish Church was conceived as a means of re-establishing the authority of Anglicanism in Sark. The cost of building came to about £1000 and was shared between the Seigneur, the tenants (landowners), and the Society for Promoting the Enlargement and Building of Churches and Chapels. Seigneur Peter Le Pelley’s ingenious scheme of offering each of his forty tenants a closed family pew, to be attached for ever to their tenement, secured nearly £300 before building began and ensured a perpetual income of rent (now miniscule) for upkeep of the church. A condition of the Society’s assistance was that at least half the total of 333 seats were to be ‘open’ to the public. By midsummer 1821 a plain rectangular building (the present nave) was complete. The original square tower was quite small and housed the ‘island bell’. This ancient bell, given to the settlers in 1580 by Philippe De Carteret, future Seigneur, used to hang from a wooden belfry on a mound to the east of the site. It now hangs at the Assembly Room. Inside the original church the east end was dominated by the pulpit: an octagonal stall centrally placed between the two arched windows, it stood on a platform six feet above the pavement. A staircase led up to it from the minister’s pew in the southeast corner (where the organ now is). The Seigneur, Reverend W. T. Collings, whose mother bought the Fief of Sark in 1852, had a keen interest in contemporary Gothic architecture. In 1877, he designed and paid £200 for the complete rebuilding of the east end, to make a relatively ornate chancel with choir, sanctuary and altar steps, and vestry. The present pulpit was installed in 1883 in memory of the Reverend J.L.V. Cachemaille, and the brass eagle lectern in 1896 in memory of his successor Charles Vermeil. The stained glass windows in the nave were made in London by Moore and Son and were installed in 1926 at the cost of various benefactors. After the church take the left hand fork which will bring you to the Sark Post Office and the village. This is where the walk ends.